Michael E. Rehr has been a practicing attorney in South Florida since 1980 and the owner of his own law firm since 1984.
in all aspects of condominium law. in all aspects of homeowner association law. defends excessive demands for fines, interest, late fees and attorney collection fees. He handles similar matters related to homeowner associations under Chapter 720 of Florida Statutes and the governing documents of the homeowner association, including preservation and revival of covenants and restrictions under the Marketable Record Title Act. drafting the Declaration of Condominium and other condominium documents to create the condominium for newly constructed condominiums and condominium conversions. representing Developers in the process of turning over control of the Association to the unit owners. 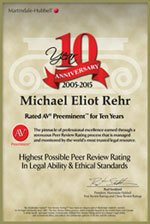 For more information about Mr. Rehr and his practice, you may access the links stated below.